Located in the heart of the San Fernando Valley, Pierce is a two-year community college with one of the highest regional transfer rates to UCLA, USC, Pepperdine University, and CSU Northridge. 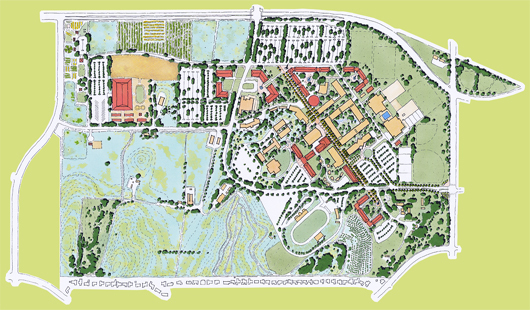 With a history of forty years of land use conflicts with the local community and lacking new facility development for over thirty years, the new administration undertook an educational, community, and physical planning process to create a comprehensive and strategic plan for the institution. Informed by an inclusive team of educators and consultants, the plan aligns land uses with the educational mission and physical characteristics of the site. Concentrating new facility development to strengthen the academic core allows a significant acreage of land to be devoted to agricultural education, with a high degree of community interface. The plan includes several partnership projects to bring scientific research and housing to the campus.